The latest feature to be added to the branch website is carpool support. When you log into the website, on the left side of the page is a link for the carpool page. Clicking on these links will bring up the Carpool page. If you click on the link in a Monthly Party listing or for a specific event, the list of displayed carpools will be for that event. The link at the top of the page will display all the active carpools. 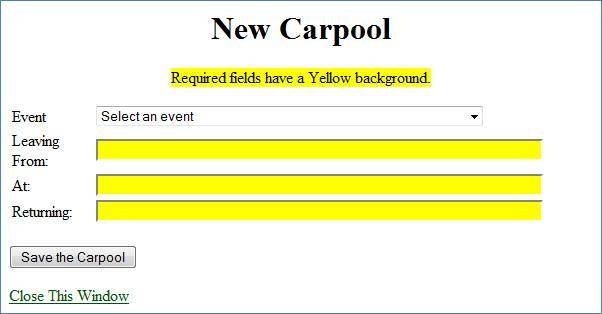 It the dropdown is displayed, select the event that the carpool is going to. Enter where the carpool is going to meet in the Leaving From textbox. It is a good idea to enter the City and the location in this area. Enter the time the carpool will be leaving the meeting place. The format for the times is 99:99 AM. Enter the time the carpool will be leaving the event in the Returning textbox. Click the Save the Carpool button to save the carpool. 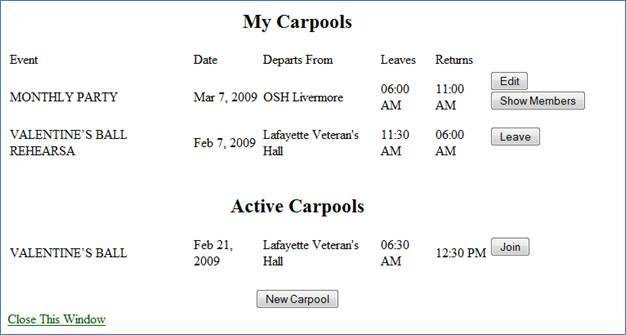 You can change the details and click the Save the Carpool button to save the changes. 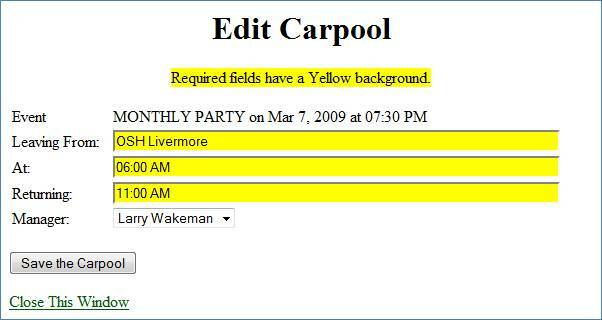 The Manager dropdown allows you to change the member of the Carpool that is the manager for that carpool. If you wish to leave the carpool, you must assign another member as the manager. These are the details of the carpool and a list of the members and their email addresses. You can click on the email address to send the member an email. In the near future there will be a link to email all the members of the carpool. If you want to join or leave a carpool, click the corresponding Join or Leave button and you will be removed from the carpool and a confirmation will be displayed.